Somehow, between trying to find new writing jobs that’ll validate that whole school business and taking on a few big projects (that must remain mum), this blog turned five years old. Is that old for a blog? It feels like it. I wonder if blog years are like dog years, or worse, gay years? (The latter in which 1 normal year is 10 gay years, and then, at age 50, you are required to retire yourself socially forever. These are simply The Pink Rules that we, as a community, have established.) Either way it feels like more. It makes me feel old. I suppose a sure sign of age is the age of your blog, in respect. Regardless, I just plumb forgot. It happens. I’m pretty forgetful when it comes to deeply personal information. I forget birthdays all the time. Not just other people’s but my own. It isn’t unlike me to receive a call somewhere in June and hear my mother’s voice, chipper as if she were hawking air freshener’s on TV, wishing me a happy birthday and for me to answer, “What? Is that today?” She assures me of the year, day, hour, and minute I was born and how I was a willful and distempered thirteen hours of labor. Oh, she remembers. Let there be no question. She says now that I’ve been a good son and that my previous obstinacy is forgiven, though sometimes I still wonder. I also forget how old I am. Constantly. I actually had to fix my driver’s license once because I put the wrong year on some update paperwork. By four years. To this day the DMV still thinks I’m 32 which is quite off (come June 2nd I’m 28, according to the calendar and calculator). BF has to correct me, often, about my age which I misquote with Letheian accuracy both high and low. It’s not just dates either. I forget all kinds of personal information, e.g., My older brother’s middle name, my license plate number, where I put the key to my lock box, the kennel I picked up Eat Beast at, BF’s middle name, both of my bothers' middle names, it’s all not there. Lord, I’m too young for Alzheimer’s. What bothers me is that those memories and facts should be there. I can still trill off the woodwind solo I learned in marching band during my freshmen year of high school. I recall most of the questions on my driver’s test. I can recite whole scenes from Beowulf and my locker combination from the nearby gym I used to be a member of six years ago. Want my mother’s flank steak recipe? It’s up there rattling around my noggin’, pushing out whatever my anniversary date with BF is. For some reason these inconsequential things take hold. They aren’t particularly relevant and memorable things either; just stuff. Antiques in a dusty attic that I never dust off but never throw away. They remain in dark corners staring at me and me back at them with overwhelming indifference that will never lead to action of any kind. So, yes, I missed my blogiversary. I don’t have an excuse. I made you some simple biscuits to apologize. Yes, you and I both like cake. We love it, in fact. Hell, we'd pimp slap the president if it meant a piece of finely-crumbed, ganache enribboned piece of cake. But, blog, trust me, birthday biscuits are just as cool. Hell, sometimes, even preferred. There’s no drama or history in these biscuits. They're just damn good biscuits. Heck, these are great biscuits. They're biscuits filled with large blocks of butter and a heart-killing pour of buttermilk. The butter melts and steams when it cooks, resulting in a texture that's almost phyllo-flaky as we both know great homemade biscuits should be. A few roughly hewed scallions add some bitter-sour-sweetness to cut through all that rather joyfully daunting amount of butter. Did I mention the blue cheese? There's blue cheese. Enough blue cheese to make you shiver with glee. I might even call these biscuits, Amazing Biscuits. Actually, blog, I'll do just that. Blog, these biscuits are Amazing. I think you will enjoy them immensely. I think your readers will as well. There. Happy Birthday, Vanilla Garlic. Sorry that I forgot. I’ll try better next year. Enjoy your biscuits. Makes about 16 small biscuits. The baking powder is optional. Without it the biscuits are cheesier, but with it they are fluffier. 1. Preheat the oven to 425F. In a large bowl whisk together the flour, mustard, salt, sugar, pepper, and baking powder if using. Set aside. 2. 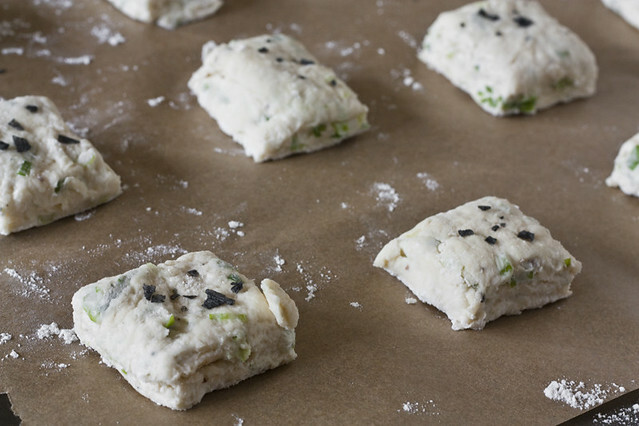 Dice the butter and toss with the flour mixture until finely coated. 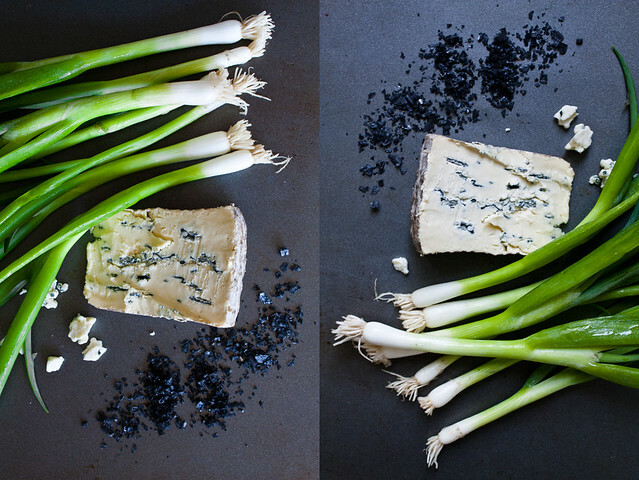 Add the scallions and blue cheese and toss until finely coated. Add the buttermilk and mix with your hands until it just comes together. (You will get messy. Just accept it.) Do not over-knead. 3. Form into an 8x8 square on a lightly floured service. Cut into squares and top with a bit of high-quality salt. Bake for 12-16 minutes or until golden. Love the recipe, I have just the right amount of Blue Cheese to try a batch today. Happy Blogiversary! Five years, nice! It was nice to meet you briefly at BlogHer Food even though you thought I was someone named Diane. 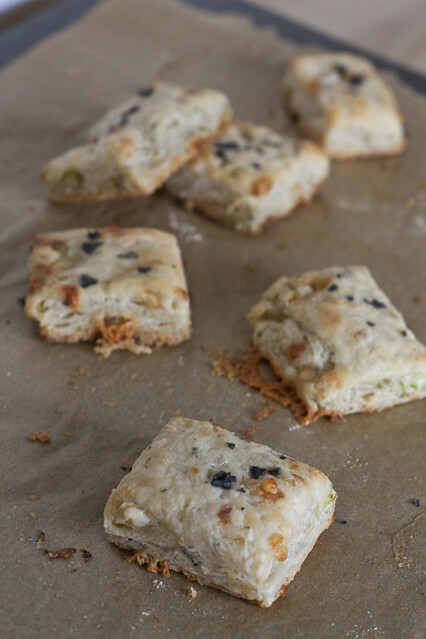 ;) These biscuits are beautiful & I absolutely have to try them! Julie: OMG, I am still embarressed about that. I was looking for someone I had only seen a tiny twitter picture of! Still, I'm glad I had the chance to meet you! Man are you a funny dude! I loved reading your blog. Hey I forget the all kinds of stupid stuff too but never my birthday! I make a big deal out of that! I do forget how old I am though. LOL So happy birthday to your blog. I can see why you have been around for 5 years. It looks great. The writing is super the photos are great and I wanted to reach into my computer and eat one of those biscuits. May have to try it! I would love to try this recipie, but the dry mustard calls for 1/2 but doesn't specify the measurement, i.e. teaspoon, tablespoon. Please let me know. Sara: These really are excellent. I encourage you to try the recipe! I made these yesterday, which was my birthday. Which I would have forgotten, except my mother called me at 7:30 in the morning to ask who was making my birthday cake. She's 1,200 miles away, and worries about these things. The best part? Mr. Blackbird isn't a fan of scallions, so I get to eat them all myself. I just had two for breakfast, slathered with even more butter. They're fabulous. cheers to selective memory, lost things in the attic, damn-good-biscuits, and celebrating non-birthdays (including your blog one)! Miri: These biscuits have a lot of moisture, hence the sog. Plus, biscuits are usually best eaten that day. Thanks Garrett, I thought it was something I did- I used Emmental by the way and they taste great! I'm a terrible baker, but these came out beautifully and made our dinner seem a bit fancier. Thanks much! Nellie: I'm so glad! I whip these up all the time. Just so easy! 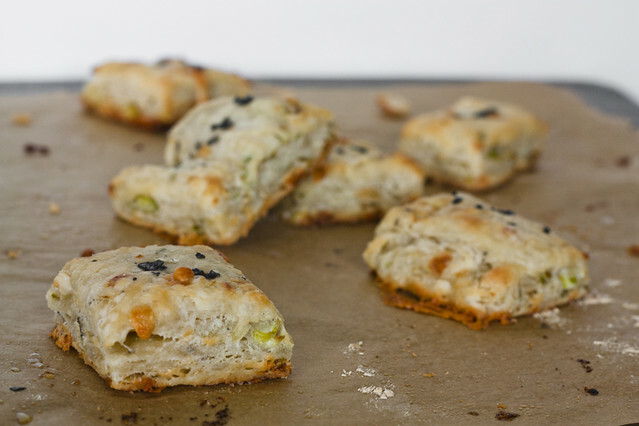 I tried those Cheese-scallion biscuits.. albeit mine turned a bit soft. Could you help me to figure why.. is excess butter the culprit? Thanks a zillion for your efforts and all the best!! Anon: Can't say. My guess would be to bake longer?